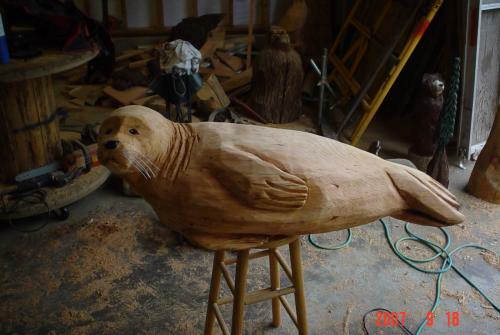 Here is a large cedar harbor seal wood carving that Eric created a while back. In order to show the pretty grain of the cedar, Eric left it clear-coated with marine spar varnish. This cute little guy was fun to carve for a couple who have a gorgeous view of the Straits of Juan de Fuca. They shared with us that they get to watch an entire family of harbor seals cavort in the surf almost daily. 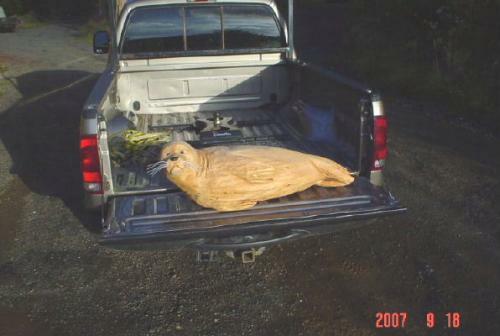 The little harbor seal cedar wood sculpture sits on their back deck facing the ocean.